So, a tagine is called a tagine, because it’s cooked in a tagine. This isn’t. I haven’t got one. Husband won’t let me have one because he says it will sit in the back of a cupboard and I’ll still make tagines in my cast iron ovenproof bowl because it’s easier and that’s what I cook everything in. I must concede that he may have a point. If you’ve got a tagine, by all means, use it to recreate my Chicken and Apricot Tagine in a more authentic manner. If you haven’t, just use a big pot with a lid! I love making meals like this. The fruity flavours are gorgeous, and the kitchen smells absolutely wonderful while it’s cooking. As soon as you throw the spices in with the onion, the fruity aroma is amazing. Then it just gets stronger as it cooks, and you add more flavours. It’s also really simple. My favourite recipes are those where you just throw all of your ingredients into a big pot and let it cook. All the flavours mature together, and it creates the most wonderful meal. It’s also nice to have something fruity for a change. We eat lots of spicy food, so this is a welcome change. Chicken and Apricot are flavours that work really well together. I also tend to add some raisins just for some extra fruitiness. It would also work well with lamb. But, I’d probably add a little more mixed spice if I was using lamb. The more powerful flavour could take it. When I make my Chicken and Apricot Tagine I add the couscous towards the end of cooking, so it’s all together in one pot. I just find this an easier way to do it. You can cook the couscous separately and serve as a side order if you prefer. We also serve ours with homemade flatbreads. Because I’ll happily eat bread with every meal going. It’s not largely necessary though, and it’s a perfectly filling meal without the extra. 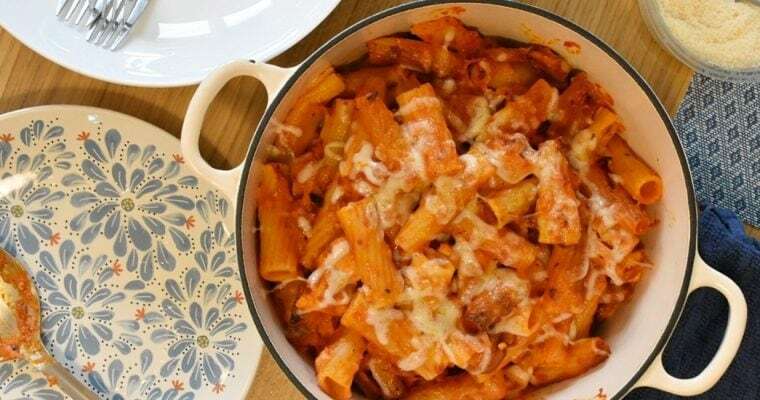 An easy one pot family meal with plenty of fruity flavour. Heat the oil in a large, lidded pot on the hob, over a medium heat. Add the onions, garlic and ginger and fry for 5 minutes until soft. Add the cumin and mixed spice and continue to fry until the onions are coated and fragrant. Tip in the chopped chicken breasts and fry for 5 minutes until the outsides are browned. Pour in the chopped tomatoes and chicken stock and add the honey. Stir together well and bring to the boil. Reduce to a simmer and add raisins and apricots. Cover and leave to cook for 30 minutes. Rinse and add the couscous and cook for a further 10 minutes. Remove from the heat, sprinkle flaked almonds on top and serve. We use a large cast iron cooking pot and serve with homemade flatbreads. Use whole-wheat couscous and a calorie-controlled cooking spray for a healthier meal. What is mixed spice and is giant couscous the same as Israeli couscous? Thank you. This looks delicious!